Robertson: We’re standing in the Parking lot where Salem Baptist Church meets the construction for 75 North where the sounds of construction will be pretty common for the next few months. 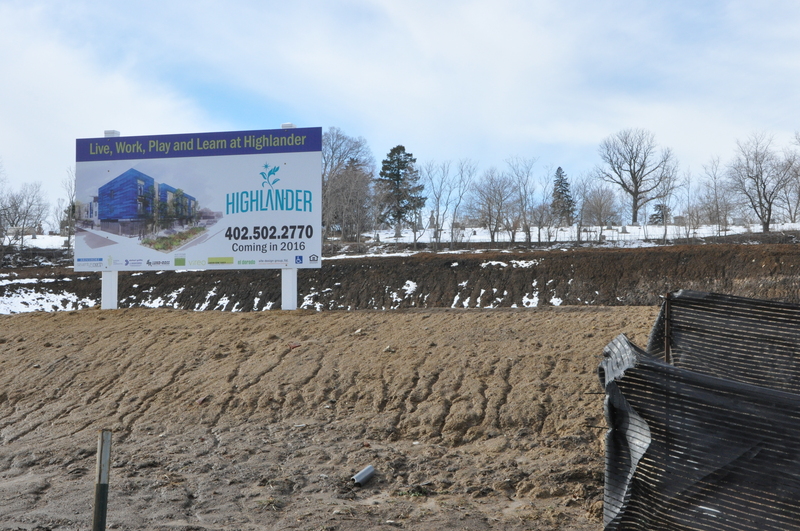 Local nonprofit 75 North is spearheading an effort to develop the Highlander Neighborhood to the tune of $100 million dollars. McDermott: 75 North is a local non-profit looking to create the next ‘purpose built community’ in the United States. The revamped Highlander Neighborhood marks the 15th purpose built community in the U.S. They are based on the Drew Charter School model in Atlanta, Georgia. It’s a three tiered approach which includes mixed income housing, a cradle to college education pipeline and a community wellness element. Robertson: Most of the construction going on now is building new houses, apartments and retail space… that sort of thing. But 75 North’s Executive Director Othello Meadows says that’s just part of that they are trying to accomplish. McDermott: Howard Kennedy is the neighborhood elementary school, and will be part of the Highlander Neighborhood redevelopment project. Students at Howard Kennedy admittedly face a lot of problems. Ninety-eight percent of students are on free or reduced price lunch. The poverty rate in the area hovers around 30 percent, and when it comes to academic achievement, out of the 805 elementary schools in Nebraska, Howard Kennedy ranks in the bottom five. Robertson: It certainly sounds like a lot to overcome, but Howard Kennedy’s new principal Tony Gunter told us he has big plans for his school. McDermott: Gunter says having the right teachers in place is a good first step. But he says we also have to change the way kids in his school are being taught. Robertson: Part of developing the language of learning is focusing on the right subjects. Nationally, many districts are focusing on STEM classes, Science, technology, engineering and mathematics. But at Howard Kennedy, the focus is on STEAM curriculum– which is like Stem, but includes Art education—things like theater and music. McDermott: Basically Gunter is saying things like music education can make kids smarter by helping to form links in the brain between what they learn and how they apply it. The President’s Committee on the Arts and the Humanities says kids from impoverished areas who have arts as part of their curriculum are four times more likely to have high academic achievement, and three times more likely to have better attendance in school. And students at Howard Kennedy will be in school more 45 minutes per day and five days more every year. Robertson: Gunter says there are also plans to add infant and toddler classrooms, to get kids learning sooner. But for me the biggest change that will help people is the fact Howard Kennedy is putting a full service Health clinic in the school. Historically, poor people didn’t have health insurance, and even with the Affordable Care Act, many people don’t have the time or money to go see a doctor. According to the Centers for Disease Control, when kids are healthy they learn more. Howard Kennedy’s medical clinic will be operated by staff from the Charles Drew Medical Center, and will be open to basically anyone in the community. In addition to basic medical services, there will be dental and behavioral health care as well. Robertson: Meadows and Gunter both say education is the most important part of turning things around in North Omaha, but teachers only have contact with kids while they are in school. They say the rest of the community, and the city as a whole, has to step up and do their fair share to ensure generational poverty is wiped out in north Omaha.